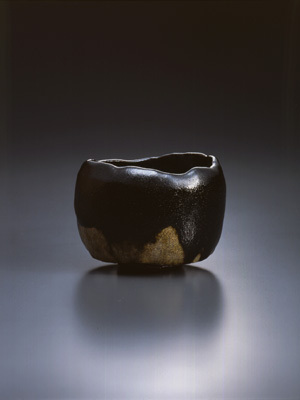 This is a tea bowl made by the current generation who tried to achieve his individual style out of the tradition of Raku tea bowls based on the fundamentals. The shape is dynamic and varied, a tint of light green partly emerging on the pitch-black texture, giving a bowl a highly modern look. This bowl is imbued with a sense of profound tranquility even if the shape is dynamically achieved by a sculptural modelling with vertical trimming. 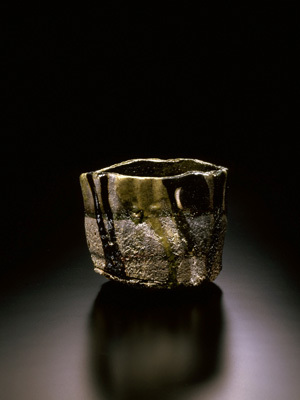 The tea bowls made by the current generation can be divided into two groups, one being traditional following the fundamentals of the Raku ware, the other being innovative and experimental beyond the traditional Raku style. Its globular shape comfortably fit in the cupped hands as well as the white glaze texture tinged with red endows the bowl a warm and gentle charm. 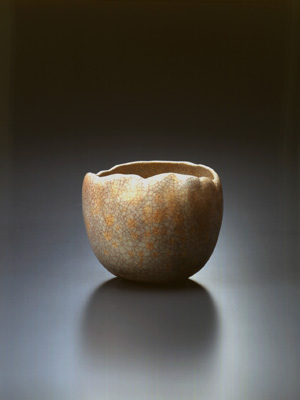 The glazing is called “reki” glaze invented by the current generation.